Keep reading and you’ll have all the evidence you need to change people’s minds! The climate of the earth has changed, and it has changed most significantly during the recent history of humanity. Scientists from NASA and National Climatic Data Center (NCDC) have analyzed thousands of years of data and found evidence that global warming is real and is due to human impact. 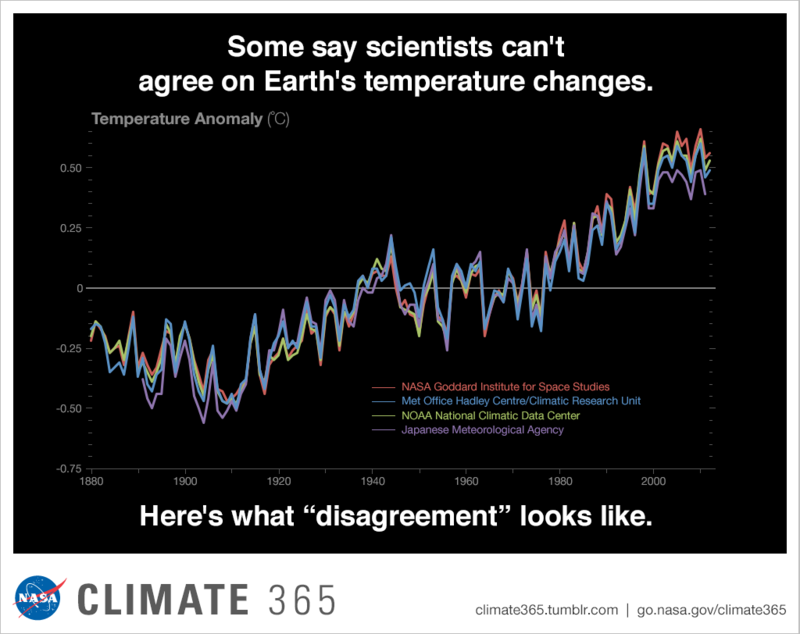 Below is evidence of global warming based on data and observations around the globe. Each year, four of the major international science institutions collect and compile data from thousands of stations around the world. Each of the agencies compare their own data from previous years and come to conclusions whether or not the global temperature is rising. The global sea level rose about 6.7 inches in the last century. However, the rate of sea level rise has doubled in the last decade. Evidence shows that the global temperature has been rising since the 1970s, with the ten warmest years occurring in the past 12 years. The top 2,300 feet of ocean waters have shown a rise of 0.302 degrees since 1969. Data from NASA’s Gravity Recovery and Climate Experiment show that Greenland lost between 36 to 60 cubic miles of ice while Antarctica lost about 36 cubic miles of ice between 2002 and 2005. Arctic ice caps reduced in both extent and thickness in the past few decades. Almost all glaciers around the world have retreated and gotten smaller. The number of extreme weather patterns, intense rainfall, extreme heat, cyclones, droughts, and record high temperatures have been increasing while the number of record low temperatures have been decreasing around the world since the 1950s. The acidity of surface ocean waters has increased by about 30 percent since the industrial revolution. This rise in acidity is because of the increased amount of carbon dioxide, pollutants and other toxic gases that we have been adding into the atmosphere and mix with bodies of water through precipitation. Most scientific evidence show that the current trend of rising global temperature is a result of the man-made “greenhouse effect.” Greenhouse gases cover the outer layer of the earth’s atmosphere like a blanket. 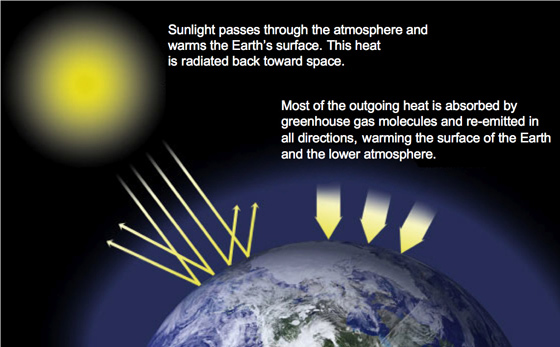 As a result, the earth’s atmosphere traps heat and reflects most of the heat back to the surface when earth’s surface radiates heat. 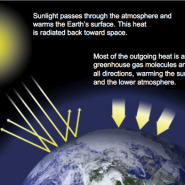 Certain gases in the atmosphere trap heat and block heat from escaping. Some gases remain in the atmosphere for a long time and do not respond physically or chemically to changes in temperature. Other gases, like water vapor, change physically or chemically with temperature. Water vapor. Water vapor is the most abundant greenhouse gas in the atmosphere. However, it changes with the climate. It expands with heat and brings precipitation back to earth when condensed. So, water vapor is called a “feedback gas” and it does not force climate change as other greenhouse gases do. Carbon dioxide (CO2): Carbon dioxide is a significant greenhouse gas. It is released both naturally and through human activities. Methane (CH4): Methane is another potent greenhouse gas that traps heat. It’s far more active and damaging than carbon dioxide. Nitrous oxide (N2O): Nitrous Oxide is a powerful gas produced by agricultural practices, especially by the use of commercial fertilizers, biomass burning and the burning of fossil fuels. Chlorofluorocarbons (CFCs): CFCs, also known as Freon, are used commercially in industry and in refrigerators, air conditioners, and freezers, now largely regulated for their ozone layer depleting nature. Human activities are changing the natural greenhouse gas balance. We have used fossil to power our vehicles, industries and homes for hundreds of years, adding a considerable amount of carbon dioxide into the atmosphere. The burning of fossils like coal and oil, increases the concentration of carbon dioxide in the atmosphere. Cutting down trees to develop new lands and to establish new buildings and industries also contributes to global warming. Trees, especially in tropical rainforests, supply about 20% of the world’s oxygen. Trees not only only supply us with food, clothing, and shelter, but they also provide us with fresh clean air, by filtering out the carbon dioxide from air. The scientific evidence found by the Intergovernmental Panel on Climate Change, has concluded with more than 90 percent probability that the global temperature has risen due to human activity for the last 250 years. A group of 1,300 independent scientific experts from countries all over the world under the auspices of the United Nations have contributed to this report and they have all come to the same conclusion. To combat global warming and climatic changes, all concerned government and non government agencies around the world, as well as every individual, must work together. There are little things in your everyday life that you could do a little differently for a greener environment. Little things like turning off your lights when you leave the room, using energy efficient appliances, riding a bike to work, carpooling or taking the bus to work. It does not matter how small or big your effort is, it could be a step to reduce energy wastage and carbon emission. Little things add up quickly in a community or in a nation as a whole, and together it becomes a larger impact on the globe; an impact large enough to save the planet. The green movement starts with you. Please add a comment in the comment box below and tell us what you are going to do today for a greener planet. We would appreciate it if you share this article and spread awareness among your friends. Please act now. To find out more about conclusive proof of climate change, watch our Webinar Huddle with Dr. Robert W. Howarth, researcher and professor at Cornell University. We would also appreciate your likes, comments and shares on our Facebook page. Please click here to visit our Facebook Page. The policies and action plans of the US government to strengthen global resilience to climate change and cut carbon pollution. What the US EPA is doing about climate change. U.S. Department of Energy: Strategies to reduce carbon emission and to combat global climate change.